One of the sometimes inevitable problems falconers run in to is a broken feather be it from improper husbandry or equipment or an uncontrollable field event. As a falconer it should be your highest priority to keep a good condition bird, and as such imping is a part of that. Imping is the process of repairing a broken feather by severing the damaged area and re-affixing the remaining feather or replacing it with a new one all together. If you’ve read the husbandry pages you will know how much PFHT stresses the appropriate care of the bird in your care. Repairing damaged feathers is part of the level of respect that you should hold for the bird. The bird in this page was a “rescue” bird that was found out of a downed tree and was improperly feed water and bread by a well-meaning bystander. I imped the bird prior to release to give the bird a better chance. The first thing that is needed to be done is to assess the damage. In the case of this merlin the damage was very severe. The nutritional/stress damage from being kept by an unknowledgeable individual was severe. 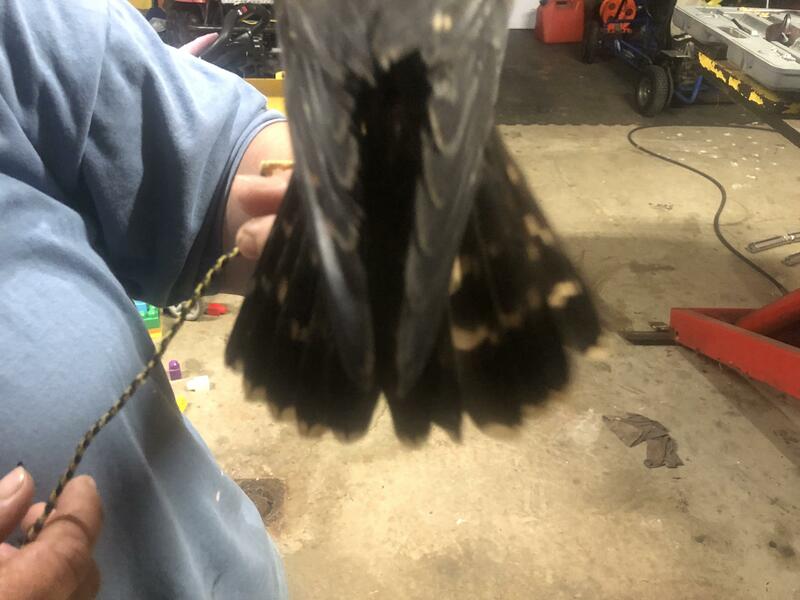 The bird was picked up from said non-permitted “bystander” by a permitted individual at a time frame that’s fairly surprising the merlin was still alive. 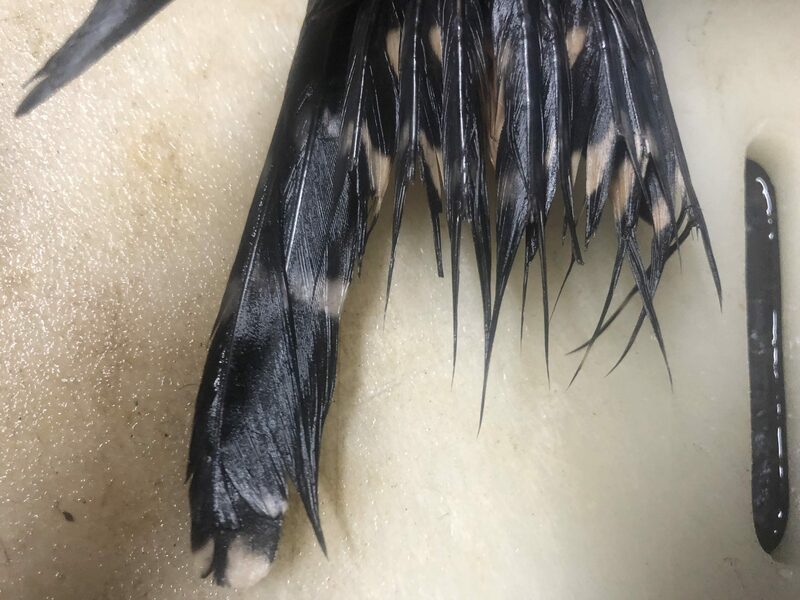 The damage included severe nutritional and stress caused weak points and “fret lines” in the feathers. 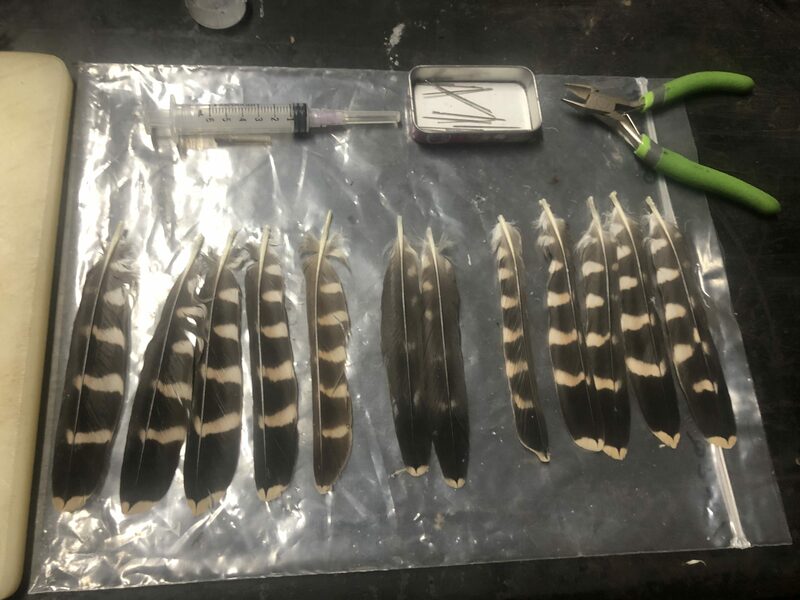 The feathers all broke at one of the multiple fret lines. It was clear in this case that the deck would need to be replaced except for two late growth feathers that showed no signs of damage. To the right is an image of the deck at the “start” of the process. Wetted down to make moving and keeping coverts and other feathers out of the way. Imping is a skill best taught by an experienced individual. I would not recommend trying to imp a feather yourself without first getting hands on lessons from another falconer. There are many tools to use and materials that can be used for imping pins. The imping pin material can be made of many thing such as other feather stalk, bamboo, pins, wooden dowel, roll pins, and even guitar wire in the case of some small birds. In some cases you can even insert the new feather inside the original feather shaft. Other materials used will include clippers, exacto knives, cements and glues of various types and speeds. Most will keep a cutting board at the ready to work on. To the right is a workstation setup to begin. 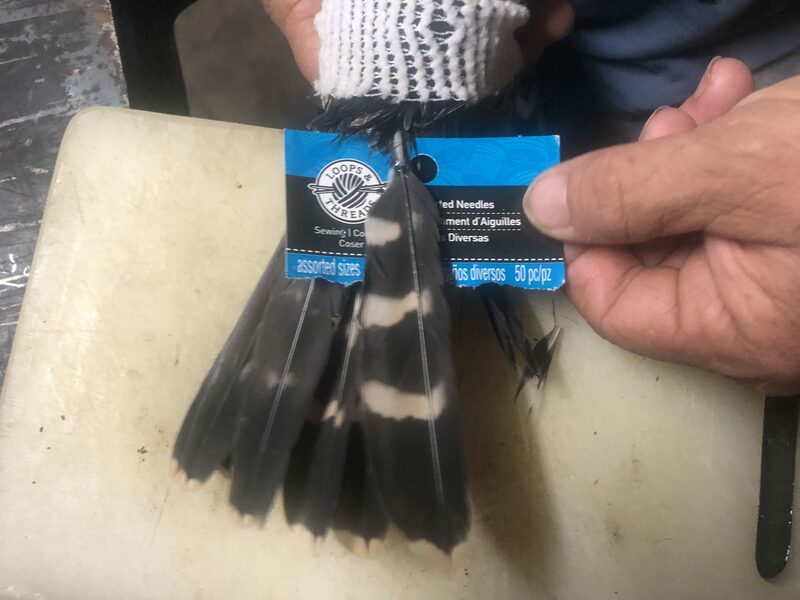 Prepare imping pin – Some falconers will put the pin in the bird side and then slide the replacement feather onto it, and others will work opposite. Apply adhesive on exposed side and insert feather. Once the repair is made the bird will need to be left hooded to remain calm. The imping process can be stressful for the bird. To the right you will see the completed deck of the Merlin. You’ll notice the existing two feathers look slightly different but overall the deck looks like a clean complete tail. The merlin will be able to fly with little to no difference from a natural deck with the properly imped tail.